. (2008, November 1). Carbon Markets: Rising Out of Thin Air: A Review of the Creation and Rise of Global Carbon Markets and Their Future Prospects Post-2012. Retrieved from http://saisjournal.org/posts/carbon-markets-rising-out-of-thin-air.
. "Carbon Markets: Rising Out of Thin Air: A Review of the Creation and Rise of Global Carbon Markets and Their Future Prospects Post-2012." The SAIS Europe Journal of Global Affairs. 01 November 2008. Web. 18 April 2019.
. "Carbon Markets: Rising Out of Thin Air: A Review of the Creation and Rise of Global Carbon Markets and Their Future Prospects Post-2012." The SAIS Europe Journal of Global Affairs. http://saisjournal.org/posts/carbon-markets-rising-out-of-thin-air (accessed 18 April 2019). This paper will focus on international climate change policy tools, cap-and-trade and the creation of the global carbon market. Additionally, I will review post-Kyoto agreement scenarios. At the start of the 2008 Carbon Market Insights Conference in Copenhagen, I was struck by the contrasting sentiments of policymakers and private sector carbon market players. The bankers, renewable energy companies, and consultants appeared already to have proclaimed victory. When the value of your market doubled the previous year from $32 billion to $64 billion, wouldn’t you? If one were oblivious to the time and location, it could very well have been 1849 with these market participants having gone up to the Yukon and back to stake their claim. In fact, they may have accomplished a far greater feat — shifting society’s value of clean air from worthless or priceless to a tangible cost. As we awaited the keynote speakers, Point Carbon, the conference organizer, was blasting Enya’s Orinoco Flow over the speakers without any sense of the irony in the song’s title. (The Orinoco is a South American river with deposits containing extensive oil sands in the Orinoco oil belt.) Nobel Peace Prize winner Dr. Rajendra Pachauri, Head of the Intergovernmental Panel on Climate Change (IPCC), and Yvo de Boer, Executive Secretary of the United Nations Framework Convention on Climate Change (UNFCCC), would soon paint a picture of the fierce international battles fought in recent years, and of the oncoming surge in 2009 to prevent catastrophic global disasters caused by climate change. In 2009, at the very same conference hall in Copenhagen, international policymakers will attempt to create a post-2012 treaty to replace the Kyoto Protocol. While the private sector remains bullish, the tone from scientists and policymakers is far more alarming. Investors have an existential requirement to maintain an optimistic stance on the future of carbon markets. The higher the likelihood of continued international and national regulation of GHG emissions, the larger the investment pie becomes. Conversely, scientists and policymakers need to emphasize that nothing in the future is guaranteed and the time to act is now. The progress made to date is noteworthy, but the current and potential future absence of emitting giants like the United States, China, and India from the agreement leaves much to be decided. Despite Al Gore and other climate change activists crusading to convince the masses that climate change is a moral and spiritual challenge, the solution lies in the ability of all countries to combat this challenge collectively. The world witnessed this international political deadlock firsthand when de Boer was reduced to tears, as international negotiating, or lack thereof, brought the 2007 Bali climate conference to a temporary halt. To date, there does not appear to be one magic bullet to prevent global warming. Shifting consumer behaviors, government regulation, improved energy efficiency, alternative energy sources, and ingenuity are all essential. This paper will focus on one of the tools, cap-and-trade. I will analyze the creation and the rise of the global carbon market and its future prospects post-2012. The Kyoto Protocol, adopted in December 1997 and enacted in February 2005, proposed targets and timelines for most industrialized countries to reduce greenhouse gases by 5.2 percent from 1990 levels. The reduction must be reached by the end of the 2008-2012 five-year commitment period. Logistically, the Kyoto Protocol outlines three specific structures for reducing emissions. The first option is cap-and-trade emissions trading among industrialized countries. A second option, Joint Implementation (JI), originates emission reduction units (ERUs) vis-à-vis emission reduction projects in industrialized countries. The third, and most controversial, option is the Clean Development Mechanism (CDM) which allows emission reduction projects in developing countries (typically funded by developed country public and private institutions) to obtain Certified Emission Reductions (CER). Ultimately, the end-user purpose of obtaining ERUs and CERs is to meet the binding reduction targets set forth in the Protocol. To achieve the Kyoto goals, member countries can implement domestic non-market policies (e.g. carbon tax), domestic greenhouse gas cap-and-trade schemes, and/or join an international carbon market. The crux of all three options is their aim to reward companies that take the lead by mitigating their own emissions—thereby developing lower emission products—and to penalize companies that lag behind leading environmental standards. While a carbon tax may be straightforward, the cap-and-trade method is a fairly new concept that the United States first experimented with during the early 1990s to curb sulfur oxide (SOx) and nitrogen oxide (NOx) emissions that were causing acid rain. Structurally, the cap-and-trade market consists of emissions credits or permits. The primary supply of these credits is from government allowances, e.g. EUAs, or European Union Allowances. The secondary supply is sourced from CDM and JI. The U.N.-governed Clean Development Mechanism gives companies an alternative to cutting their own emissions by acquiring additional credits via clean-air projects in China and other developing countries that would not otherwise be financially viable. However, Each CDM/JI project must be approved by the UNFCCC. The permits carry the right to emit one ton of carbon dioxide or an equivalent level of other greenhouse gases. The other greenhouse gases include: methane (CH4), e.g. decomposing landfill, nitrous oxide (N20), e.g. vehicle exhaust fumes, hydrofluorocarbons (HFCs) used for refrigeration, perfluorocarbons (PFCs) produced in the making of semi-conductors, and sulphur hexafluoride (SF6) which is a by-product of aluminum manufacturing and the electronics industry. The global warming potential (GWP) of greenhouse gases like hydrofluorocarbons is more severe, and thus abatement projects for these yield substantially more carbon credits. Figure 1 demonstrates that with 1 percent of the total projects, HFC projects have produced 20 percent of the carbon credits in the developing world. The efficient race to GHG abatement project quality is mutually shared by financiers and environmentalists. However, the low-hanging fruit of abatement projects are disappearing. The right to pollute is linked to production levels. Essentially, the more a company wants to produce, the more permits it requires. Conversely, the ability of a company to implement more energy efficient production methods and technologies lessens their permit demand. This overage and shortage of permits linked to the opportunity cost of producing/not producing monetizes the cap-and-trade market. The higher the cost, the more pressure producers will feel to use energy more efficiently and to research and instigate the development of alternative sources of energy that have low emissions. Buyers and sellers of the carbon permits can range from governments, private companies, and speculators. 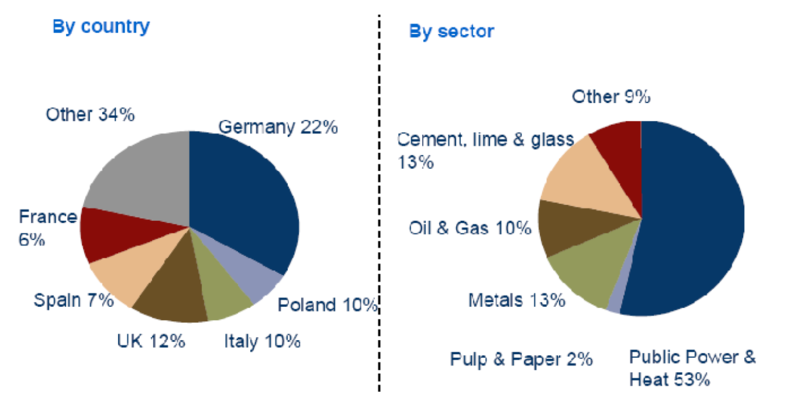 To date, the majority of the current buyers of CDM credits are in Japan and Europe. In the event that other large industrialized nations, i.e. the United States, China, and India, approve a post-Kyoto climate treaty, they could leapfrog to the top. Figure 2 demonstrates that the overwhelming majority of CDM projects are physically located in China, India, and Brazil. This supply-demand relationship between G-8 countries and the fast emerging markets of the developing world will be the most difficult relationship to manage when “Kyoto II” is negotiated in Copenhagen in 2009.
international trading obligations under Kyoto. Pundits are quick to point out the faults of Phase I of the EU ETS. From 2005-2007, consumers observed higher power prices because of an embedded expected price of carbon. However, an over allocation of EUA credits quickly led to a price crash in 2007. With the price nearing zero, utility companies that passed on higher prices to customers were now achieving windfall profits. The over allocation of credits was also detrimental in achieving any real emissions reductions. Opponents of cap-and-trade will stop there and lead their audience to believe that cap-and-trade has failed. What often gets lost is that the EU ETS is a three phase program with built-in measures to rectify design issues. In an attempt to prevent windfall profits during Phase II, EUAs are now auctioned off instead of being given away for free. The amount of credits allocated has been ratcheted down and the price of EUAs due for December 2008 is now trading over 20 per Mt CO2e. While the Lieberman-Warner Climate Security Act failed to gain Senate approval in June 2008, both 2008 presidential candidates have expressed their support for a cap-and-trade scheme. Senator Barack Obama supports a plan to lower emissions 80 percent by 2050 from 1990 levels. On the other side, Republican John McCain, who previously introduced a similar bill with Senator Lieberman calling for a 60 percent reduction, also supports mandatory emission caps. Sadly, there has been little debate between the candidates on the merits of their respective climate change proposals. In three dozen presidential debates, the subject of climate change rarely appeared. As one of Senator Clinton’s advisors indicated, “It’s too complicated to talk about on the stump.”6 Although it may be a new paradigm for U.S. citizens, they need to be better informed on how a cap-and-trade scheme will impact them. Half of the United State’s electricity and a third of its CO2 pollution come from coal-fired power plants in 25 states. Coal producing states are reluctant to support a cap-and-trade scheme that will adversely affect their business models and encourage consumers to shift to cleaner natural gas. Rather than the typical divide of red and blue states that we see in U.S. politics, we are beginning to see a new classification of states — green and brown. The energy exporting (interstate and international) brown states are taking economic stances against regulation and the green states are taking moral stances in favor of regulation and innovation. The green states are also using the economic argument that the creation of “green jobs” and new innovation can actually drive the economy and reduce U.S. dependency on foreign oil. Energy producing interest groups point out that the U.S. needs to use more of its own coal, natural gas, and oil (e.g. offshore drilling) to reduce U.S. dependency on foreign oil. A recent study by New Carbon Finance, a low-carbon economy primary research group, indicated that the U.S. carbon market could be valued at $1 trillion by 2020, dwarfing the size of the EU cap-and-trade carbon market7. Their study also estimates a carbon price of $40 per ton. At this price, consumers would observe price increases of 20% for electricity, 12% for gasoline, and 10% for natural gas. After taking a backseat during Kyoto, entering into a cap-and-trade scheme may catapult the United States into the driver’s seat of international environmental policy. However, despite having the potential for a large domestic carbon market in the future, the United States cannot take a familiar “either you’re with us, or you’re against us” tone. “There is now, I believe, a global consensus that cap-and-trade is the way to go,” said Yvo de Boer in a recent interview with the Financial Times8. As the heir apparent of climate change leadership, the United States must figure out a way to engage China and India in the next round of climate negotiations. The European Union has demonstrated commitment to carbon markets regardless of other country actions. It is safe to assume that the European Union will ratify a Post-Kyoto treaty. Another safe bet is Australia, one of the largest per-capita emitters. In December 2007, newly-elected Prime Minister Kevin Rudd signed the Kyoto Protocol hours after being sworn-in. After these major emitters, we find ourselves in a crap-shoot chain of events. The biggest stumbling blocks lie with the United States and China. The United States will be hesitant to take on internationally binding targets unless China does the same. Canada, another large per capita mitter, signed the Kyoto Protocol but did very little to support the agreement. International environmental policy experts expect Canada to follow the United States. Japan, an active KyotoI participant, has indicated that its commitment is dependent on U.S. and Chinese actions. This leads us to China. Currently, China (and other G77 countries) desire lesser or non-binding emission targets because of their developing status9. If there is anything to be taken from the projected domino of events above, it is that developed countries are dependent on the actions of China and other developing countries, whereas developing countries appear independently to be assessing their participation in a post-Kyoto treaty. These battle lines go hand-in-hand with the so-called developed-developing divide. This divide asserts that developed countries emit more per capita, but developing countries have cheaper options to reduce emissions. The largest abatement opportunity lies in forests, which account for approximately 20% of global GHG emissions. The world will look primarily to Indonesia and Brazil to halt the rapid their deforestation. Additional abatement cost savings in developing countries are found in retrofitting archaic manufacturing plants to capture GHG emissions or using clean technologies (wind, solar, hydro, geothermal, etc.) to generate energy that otherwise would not have been feasible without the revenue stream from carbon credit generation. 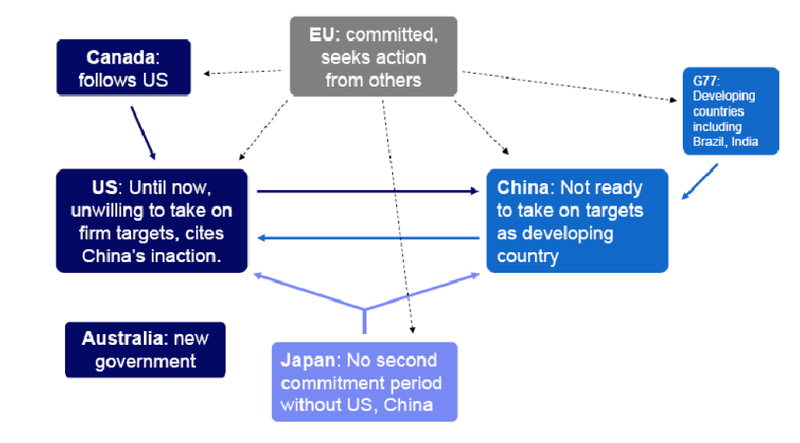 To even the playing field and increase the credibility of developing country participation, the United States, the EU, Japan, Australia, and Canada must figure out how to persuade China to participate in binding targets after 2012. A scenario where all countries, except China, reduce their emissions may be a futile effort to stem the adverse effects of climate change. In 2007, China overtook the United States as the largest producer of CO2. This occurred a few years earlier than expected, but it should not be surprising given China’s exponentially growing energy demand. With oil prices skyrocketing, they have focused elsewhere for energy—coal. With 38.1 percent of worldwide coal production, double the next closest producer (the United States); China is burning the least environmentally friendly fossil fuel. China is sitting on an environmental disaster with its abundance of coal deposits and increasing energy demand. China, along with other developing countries like India and Brazil, are facing requests from the industrialized world to cut back on their emissions. However, we cannot lose sight of the fact that the industrial revolution and rapid post-World War II growth of developed countries played the largest role in the current climate crisis. During Kyoto, China was given a free pass and no binding emissions reductions were required of it. This was one of the main reasons the U.S. government cited for its decision to abstain from the Kyoto Protocol. The showdown that occurred during Kyoto I has yet to be resolved, and the issues likely will resurface in Post-Kyoto negotiations in Copenhagen. How do developed countries engage China and the G-77? One utopian scenario is that they won’t have to. China may choose to participate because it may determine that such a course is the best option economically and politically. Realistically, the developed world must determine the best stick and carrot combination to deter China from freeloading on their climate change abatement measures. Given China’s status as one of the top five exporters in the world, developed countries, with the help of the World Trade Organization, should categorize China’s abstaining behavior as anti-competitive and apply a carbon-based import tariff on Chinese goods. The tariff must be substantial enough to shift consumer behavior. Perhaps the easiest way to persuade dissenters is to demonstrate to international policy makers that the costs of inaction far outweigh the cost of action. Just as the USSR and the United States understood the scenarios of Mutually Assured Destruction, we may be witnessing American and Chinese policymakers entering another game. The outcome of this strategic game, assuming that the cost of inactivity of either participant is insurmountably high, would guarantee each country’s participation in a post-Kyoto treaty (see Figure 5). A sample normal form game, using hypothetical cost values of a post-Kyoto treaty to the United States and China, is one method for predicting their actions. Because of the sheer magnitude of the economies and, in turn, greenhouse gas emissions, we can estimate that both countries will want the other to act. One country’s payoff values of entering into a climate agreement are dependent on the other countries’ actions (strategic interdependence), i.e. CO2 released into the air is not cognizant of national borders. The values in Figure 5 list U.S. payoffs first and China payoffs second. The asterisk denotes the optimal solution, given the other parties available choices. International policymakers will be preparing similar cost-benefit analyses (albeit analytically rigorous and with real data) for the Copenhagen 2009 negotiations. The global interdependence of energy scarcity and climate change are two of the most important issues facing our generation. The tipping point has occurred where society now understands the implications of these challenges. If we define our success solely on these points, we have yet to succeed in solving either crisis. A successful global carbon market will concurrently address both of these issues by putting a cap on GHG emissions (instead of a tax without a ceiling) and redirect government proceeds to fund research & development in alternative energy. Its rapid growth gives the appearance of rising out of thin air; however, effort to put a price on carbon has been in the works for over a decade. U.S. policymakers should look to their friends to the east, the EU, to observe that this dream is now a reality. The EU’s cap-and-trade scheme is not without its faults so far, but like any good political institution, built-in checks and balances have allowed opportunities to make modifications thereby increasing the likelihood of achieving emission reduction goals. The U.S. should follow suit and develop a national regulatory scheme and establish short-term and mid-term GHG reduction goals prior to the Copenhagen conference in late 2009. This aggressive approach will leave China with no choice but to accept binding emissions targets. This will be a tremendous domestic political challenge for the next U.S. president, but it is the first step into improving public opinion around the world. Adam DeRosier is currently pursuing a MA in International Relations at the Johns Hopkins School of International Studies and an MBA at the Tuck School at Dartmouth College. He has worked as strategy consultant for Deloitte Consulting and, more recently, for Climate Change Capital, the largest private carbon investment fund, researching U.S. and international climate change policies.